While some believe backyard ponds and waterfalls to use lots of water, Nature’s Re-Creations in St. Louis has an eye towards sustainability. We focus on an ecosystem approach that relies on a natural balance of fish, plants, gravel and filtration to ensure environmental excellence. 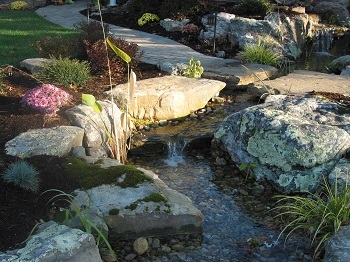 By combining your water feature with our rain water harvesting system, you work with Mother Nature, not against her, while enjoying the beauty and therapeutic elements of a decorative pond or pondless waterfall. Simply put, rain water harvesting is the accumulation of rainwater for reuse. It is similar to the old style cisterns people used to have on their properties. We harvest rain by collecting (typically from a downspout), pre-filtering and storing it in an underground reservoir – attached to a decorative water feature – that filters and aerates the water until it is reused. Rain water harvesting can be incorporated into almost any water feature to make it more sustainable and reduce storm water runoff, which is an environmental problem in our area. As Certified RainXchange Professionals, Nature’s Re-Creations believes that environmental conservation is incredibly important. Urban infrastructure and development is ever-increasing and leading to greater storm water runoff, replacing the process by which natural plants and soils absorb natural rain water. Storm water runoff is one of the largest environmental issues that exists in our area today. Some areas out West have too little water, but in the Midwest we tend to have too much, causing flash flooding issues and erosion. The Environmental Protection Agency (EPA) states that rain water falling on ones’ property is the largest wasted natural resource. Nationally, billions of gallons of raw sewage are deposited into our natural waterways each year due to storm water runoff wreaking havoc on our natural waterways and polluting them to the point that nearly 45% of our natural streams, creeks, lakes, estuaries and bays are contaminated and no longer fit for human interaction, such as swimming or fishing. This is an alarming fact and we can begin to solve this issue with a properly designed rain water harvesting system. Nature’s Re-Creations looks for solutions to capture and reuse our resources as an effort to improve our environment. Our world depends on us to take the first step to improve our planet’s water supply. The RainXchange™ System by Aquascape, Inc. combines decorative water features with an efficient rain water harvesting system that collects, filters and reuses water. Not only does the RainXchange™ System filter the stored rain water to create a sustainable water supply for irrigation of your environment, but it adds significant beauty to your landscape as well. Click Here To Learn More About The RainXchange™ System by Aquascape, Inc. While you’re enjoying your decorative water feature, the RainXchange™ System is constantly aerating the stored rain water to prevent the growth of bacteria and unwanted algae and vegetation. The stored rain water is easily accessible at any time. Attached to the system is an on-demand booster pump that is connected to the feature and a garden hose to access the stored water for use to water your landscape or anywhere outside your home. The stored water in the RainXchange™ System is constantly filtered and flowing, attracting wildlife to gather around your water feature. 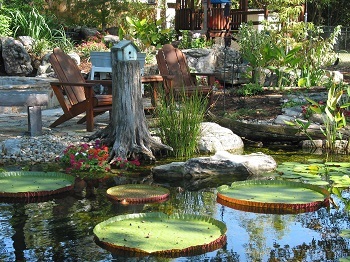 The water in your landscape becomes a sanctuary for birds, butterflies, dragonflies and even frogs. 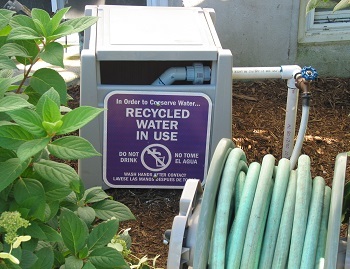 For more information about rain water harvesting in St. Louis, contact Nature's Re-Creations today at (636) 223-2330.